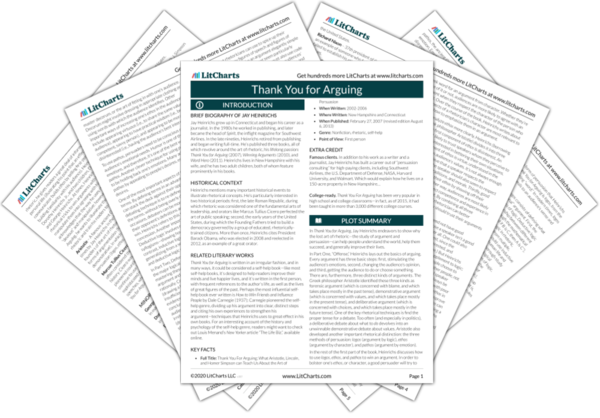 Instant downloads of all 946 LitChart PDFs (including Thank You for Arguing). 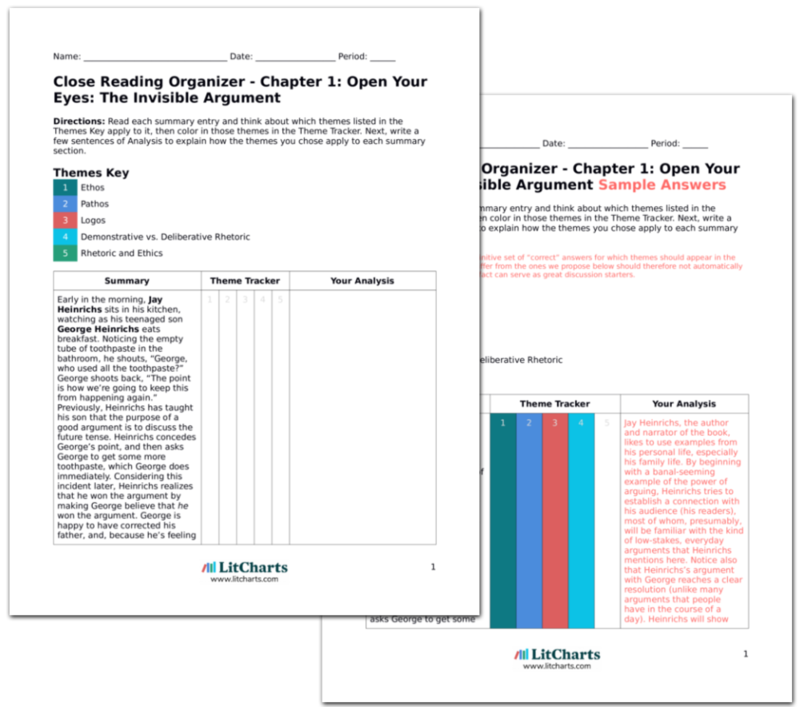 LitCharts assigns a color and icon to each theme in Thank You for Arguing, which you can use to track the themes throughout the work. In this chapter, Heinrichs will talk about the identity strategy—building a connection with an audience. When an audience identifies with a speaker’s character, they have an easier time agreeing with whatever choices the speaker makes. It’s often a good idea for a rhetorician to emphasize some kind of connection with their audience (an idea that Heinrichs addressed in the previous chapter, too). There are times when establishing an identity is the “sole purpose of an argument.” Most of the time people don’t get to make full, well thought-out arguments, because they don’t have enough time and because they’re interrupted by other things. Consider a couple that’s arguing about going to visit the wife’s elderly relatives in another state. The husband could make a convincing case that 1) traveling on the day before Thanksgiving will be hard, 2) the food will be bad at her parents’ house, and 3) he wants to have some peace and quiet with his family. But even if the husband won this argument, his victory would be short-lived. He’d loosen family ties and might even alienate his wife. Therefore, the husband needs to win the argument while also convincing his wife that not visiting her parents is “good for everybody.” This may seem devious; however, readers need to be aware of the identity strategy to that they can recognize it in their own lives, and learn how to resist it. First, it’s suggested that a strictly logical argument, explicitly advertised as an argument, might not be the most effective way to convince one’s spouse to stay home for Thanksgiving. Great rhetoricians can win an argument without even letting on that they’re arguing in the first place. Second, Heinrichs admits upfront that he’s describing a somewhat devious, manipulative process. Such behavior could be considered disrespectful or condescending, since it implies that the audience is gullible and not worth being treated honestly. But while rhetoric can certainly be used to manipulate, it can also serve a higher moral purpose; to bring people together and encourage them to put aside their differences and move forward. To begin with, logos can be a distraction in the identity strategy; sometimes, it’s better to fall back on identification language and other techniques of ethos and pathos. Imagine the couple arguing about Thanksgiving. Instead of making a logical case for staying at home, the husband could make a joke about the wife’s mother (an impression, say) that gets the wife laughing, and reminds her that he’s on her side. Then, the husband could say, “You really want to go, don’t you?” Having slightly guilt-tripped his wife, and therefore established a moral high ground, he could say, “You know I love your mother. I’ll support you in whatever decision you make.” Notice how the husband used code words like “support” and “love,” and pressures his wife to make a choice. It’s then more likely that the husband will avoid a Thanksgiving visit to his in-laws, and he’ll do so without alienating his wife. Instead of using logos, the hypothetical husband has more luck with pathos and ethos—underscoring that logic by itself isn’t always enough to win an argument. By establishing a strong bond between himself and his wife, the husband has an easier time convincing her that he really does have her best interests at heart—and, therefore, an easier time pressuring her into staying home for Thanksgiving. Heinrichs’ underlying assumption seems to be that it’s easier for the husband to go to elaborate rhetorical lengths to trick his wife than to just be upfront with her—an assumption that many people, married or otherwise, would be inclined to disagree with. Code grooming has a dark side: language is about excluding people, not just including them. A person’s vocabulary defines their “tribe”—their family, class, nationality, etc., while excluding them from other tribes. Irony is a great way to use language to emphasize tribal lines. When someone says something ironic, other people in the tribe will get the irony; outsiders won’t. Heinrichs remembers seeing the movie Adaptation with his daughter—in one scene, a character says something so sappy that it’s clearly meant ironically. But someone else in the theater began crying and nodding at the line—at which point Heinrichs and his daughter laughed. They cemented their own father-daughter bond by getting the irony, and laughing at those who didn’t. Much of the art of rhetoric revolves around building a connection between different people—and, at the same time, excluding certain groups of people. As every third grader knows, one of the strongest ways to make a group of friends is to exclude other students. By laughing at the excluded people, a group reminds itself of its common cultural bond, whatever that bond might consist of. And this concept has much more sinister applications as well, of course, resulting in racism, prejudice, and violence. 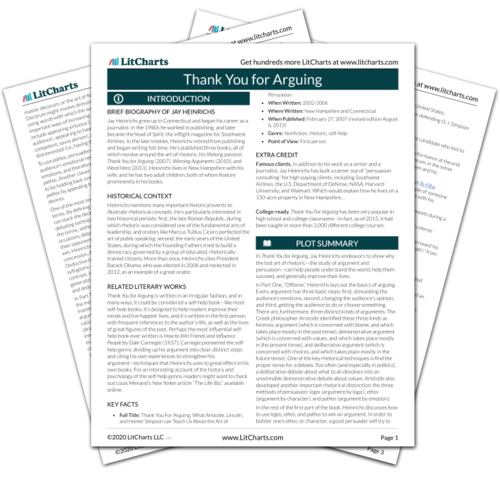 Get the entire Thank You for Arguing LitChart as a printable PDF. Code grooming has become a major part of advertising: once businesses recognize their clients’ tastes and preferences, they can predict their clients’ behavior very accurately. With each demographic comes a different set of code language, which shows up in ad copy. It’s important for people to be conscious of the words that make them feel good about themselves so that they can recognize these words’ influence. Advertisers understand the importance of specific trigger words: some words have such a strong emotional association that simply seeing the word will put audiences in a certain state of mind. By recognizing which words have the strongest effect, readers can train themselves to resist such manipulative techniques. Arn, Jackson. "Thank You for Arguing Chapter 20: Make Them Identify with Your Choice." LitCharts. LitCharts LLC, 2 May 2017. Web. 24 Apr 2019. Arn, Jackson. "Thank You for Arguing Chapter 20: Make Them Identify with Your Choice." LitCharts LLC, May 2, 2017. Retrieved April 24, 2019. https://www.litcharts.com/lit/thank-you-for-arguing/chapter-20-make-them-identify-with-your-choice.